Copyright (c) – Musidor N.V.
"Small" metal zipper on front that unzips to reveal cotton briefs. Sleeve is open at both top and bottom of sleeve. Anyone else have a crack in the dead wax from that zipper on the cover? Just found an original pressing at an antique store. Great condition.....a bargain at $25! Hi y'all! I recently bought a copy of this printed in France...180g...The mix is TOTALLY different...certain guitar parts lower, etc. Thought my hifi system was messed up! Anyone know anything about this, or am I just going insane? Is this vinyl the same cat number and label as the double vinyl with the zip ? Some of the pressings in the double vinyl , finger prints and dull marks all over both sides of the first vinyl so I'm trying to replace it. Is the quality a better pressing for the single vinyl ? THX a lot for helping... i hope somebody can help me. I have a uk copy. Without zipper and sleeve printed by west brothers. Does anyone here have a clue about pressing year for this? my record got zip with pan sign and is round on the end. is anybody got any information about? My record got round zip on cover. Is anybody knows what edition is it? 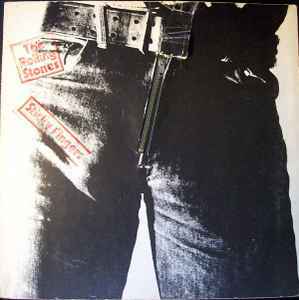 The Rolling Stones are at the height of their powers on this record with the beguiling guitar work of Mick Taylor providing the glue that forms this brilliant collection of songs into a masterpiece of modern music. The songwriting, musicianship and production are impeccable.